Carbon-Sensing Satellite Prepares For Second Launch : The Two-Way An earlier version of the satellite crashed into the ocean near Antarctica shortly after launch. Scientists are keeping their fingers crossed for the second attempt. 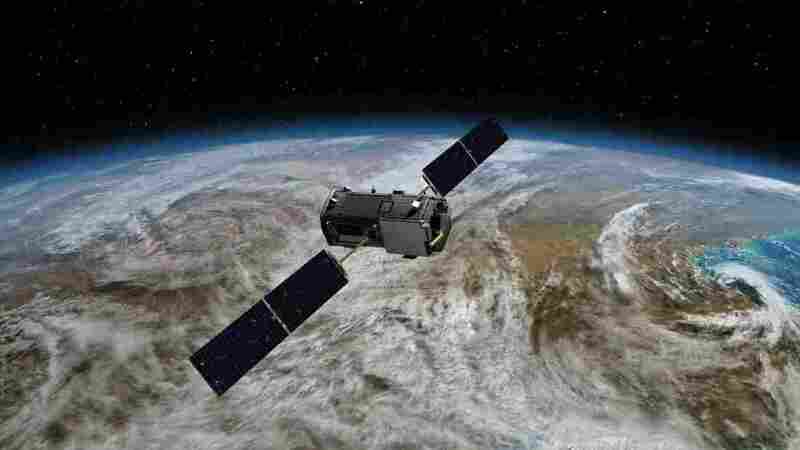 The Orbiting Carbon Observatory-2 will monitor carbon dioxide emissions. NASA is preparing to launch a satellite capable of monitoring carbon dioxide emissions from space. The Orbiting Carbon Observatory-2 (OCO-2) will be the first U.S. spacecraft dedicated to seeing the greenhouse gas from orbit, and could pave the way for new technology to enforce future global warming treaties. But first OCO-2 needs to make it off the ground. An earlier version of the satellite (known simply as OCO) crashed into the ocean near Antarctica shortly after launch. David Crisp was in Mission Control back in 2009, when the original launch took place. Crisp led the team that built the OCO mission and is now science team leader for OCO-2. As he watched the satellite fall back to Earth, he says, "I felt like somebody had rolled a concussion grenade into the room and it had gone off." The stakes are high, Crisp says. Carbon dioxide coming from power plants and tailpipes is the main reason our planet is warming. Scientists have been obsessively watching CO2 levels rise for decades, but the way they do it hasn't changed. "Since about 1958 we have been making very, very precise measurements of carbon dioxide by essentially filling bottles full of air, shipping them to Boulder, Colo., primarily these days, and running it through a series of very, very sensitive laboratory instruments," he says. The samples show carbon dioxide levels are creeping up, but they can't tell scientists exactly where all that CO2 is coming from. "We don't have these snapshots that really show what's happening right now, over, let's say, all of Texas," says Steven Wofsy, an atmospheric scientist at Harvard University. Understanding regional emissions is particularly important at the moment because cities in the developing world have been growing — adding power plants and cars. The growth is so fast that scientists cannot keep track of emissions with traditional accounting methods. There is also great uncertainty about how forests and oceans are absorbing CO2. Regulation of the gas can't move forward unless both human emissions and natural cycles can be well understood, Crisp says. OCO-2 is only an experiment. The picture it makes will be very fuzzy, and it won't be able to look at every city on the planet. The air sampling method currently used will likely remain the gold standard for some time to come. But OCO-2 might lead to new weather satellites that could also monitor emissions closely. And those satellites could be used to enforce future global warming treaties. That's why the Obama administration decided to build a second copy of OCO. Crisp says that the inability to quantify emissions was a major stumbling block during the failed Copenhagen talks on climate in 2009. To make sure things go right this time, NASA is paying more money for a more reliable rocket. As for the satellite itself, Crisp is hopeful it will work flawlessly: "We very rarely have an opportunity to build something twice," he says. "We had that opportunity this time, so we used a lot of extra care, and we have a lot of confidence." This post previously stated that NASA's OCO-2 is the first dedicated greenhouse gas satellite. In fact, Japan's Greenhouse gases Observing SATellite, or GOSAT, was first.